“I am up to 13 stock holdings and am showing about a 9% profit. Our goal is to provide subscribers with the means to protect — and grow — wealth, no matter what turmoil the financial markets throw our way. That includes core holdings in the ultimate safe asset, gold. But it also means finding investment opportunities around the world in other commodities, like energy, as well as companies across the investing spectrum that can thrive during times of market chaos. 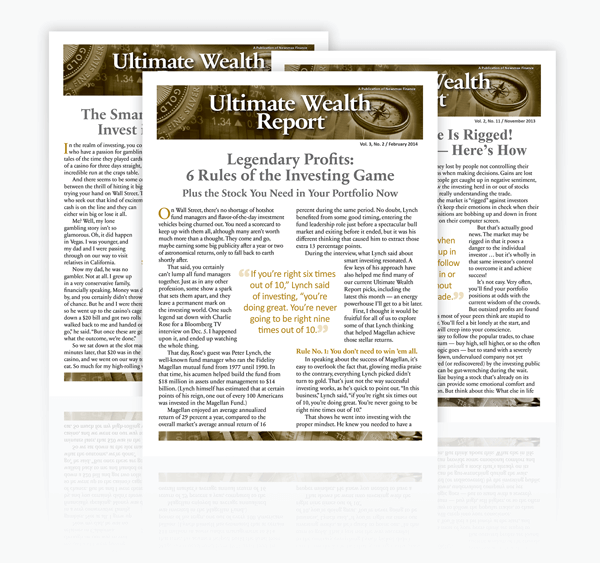 *Newsmax publishes Ultimate Wealth Report to provide information that a subscriber who is considering an investment may evaluate as part of the total mix of information available. Subscribers should understand that any investment decision they might make is their own. Investors should carefully consider all information and discuss his or her investment choices with a qualified professional. Newsmax is not an investment adviser, broker dealer, or any other type of financial advisor. Newsmax does not provide individual investment advice.